Scientists are a careful and deliberate kind. They won't rush in; they like to be sure that everything is working before trying something new. Sometimes they will wait years, decades even, before finally allowing themselves to try the very thing that they have dedicated so much time and effort to. The seventh of November, 1991, was such a day. After nearly four decades of research and preparation, the world would finally witness the first deuterium-tritium experiment at JET. Up to that time all fusion experiments had been conducted with a proxy: a deuterium-only (D-D) plasma—an almost identical gas, but easier to handle than radioactive tritium. D-D reactions, however, do not generate the power output of the real fuel. But on this day, the practice runs were over. As they had done many times before, the operators turned the magnets up to 2.8 Tesla. They fired the discharge and created a stable H-mode plasma with current of 3 mega-amps. When they were sure that everything was stable, they opened the two neutral beam injectors that had been newly adapted for tritium and sent in a tiny shot of fuel, containing only 1 percent tritium. Suddenly, theoretical fusion reaction became real. 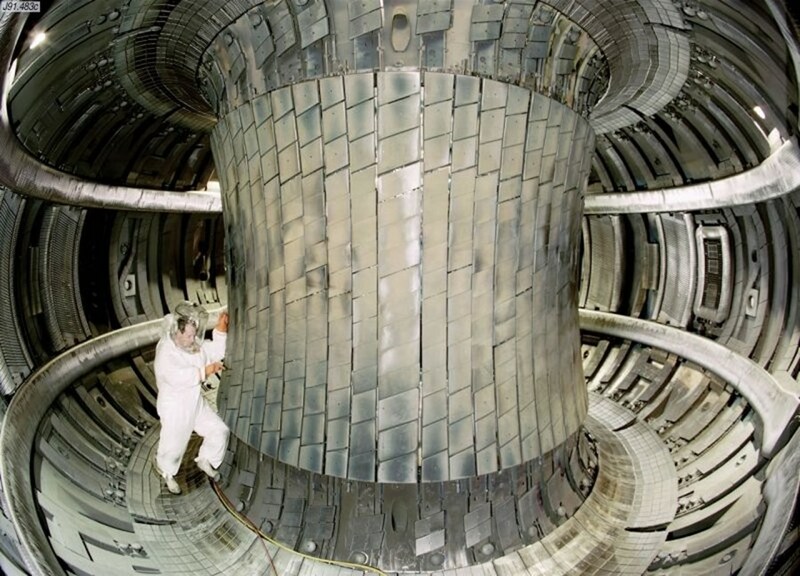 Neutrons flooded into the detectors, and were measured at a peak rate of nearly 1017 per second. The heating systems felt their load lifted as the hot helium nuclei began to buoy the plasma's energy levels. Power levels surged to levels high enough to run the surrounding villages, and then it was all over. In a mere second, decades of research and experimentation had culminated in success. With these few short pulses, using less than a fifth of a gram of tritium, JET opened the door for future research. 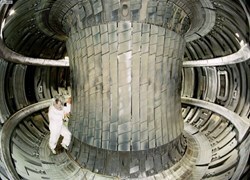 Aside from the production of 1.5 MW of power, the know-how for handling tritium and the measurement of its behaviour in a plasma gave the JET team the confidence to plan a full deuterium-tritium campaign for four years down the track, which ultimately set the world record for fusion power that still stands today.